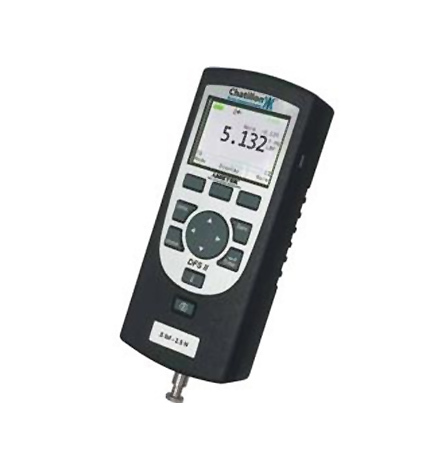 The Chatillon Digital Force Gauge Series marks a new era in digital force measure¬ment. This compact, easy-to-use force gauge is designed for economy applications without compromising functionality. Ideal for hand held or test stand applications. The gauges are available with capacities from 10 N to 2500 N.
The gauge is features an integral load cell with a measurement accuracy of better than ±0.25% FS. A large, easy-to-read, high resolution dot matrix LCD full color display supports a variety of standard gauge functions including normal and peak read¬ings, high/low limits, set points, pass/fail results, statistical results, load cell actuation and direction. Loads are displayed in ozf, gf, lbf, kgf and N units. The display can be inverted and displayed results may be “hidden” from the operator. The Digital force gauge may be used to collect production sample data at the end of a production line and the data can then be analyzed using the optional Nexygen DF software. Use the gauge handheld to perform a sophisticated "go"/"no go" test for holding strength of a connector where the operator can easily see if the test result is a "pass" or "fail". Mount the gauge on a Chatillon LTCM test stand and connect a computer for online recording of quality testing data for incoming material inspection conformance.